Ultra thin slim special creative design with only 0.7 inches (18mm) thickness body. Bio Impedance Analysis (BIA) technology measures Body Fat, Hydration levels (Body Water), Muscle and Bone mass within seconds. New "Sense-ON" technology gets instant readings without touching any button to turn on. 2010 Reddot Design Award, the device holds up to 8 user profiles, with its 12.25" (31.10 cm) square tempered glass platform and 0.70" (18mm) thickness, sleek, low-profile design and its ability to monitor personal fitness levels, it is a perfect tool for any family. Powered by the latest Bio Impedance Analysis (BIA) technology with 4-electrodes to estimate the percentage of body fat, body water, and muscle & bone mass. BIA is considered reasonably accurate for measuring groups, or for tracking body composition in an individual over a period of time, but is not considered sufficiently accurate for recording of single measurements of individuals. As BIA is based on body water balance, your state of hydration can impact the level of accuracy. 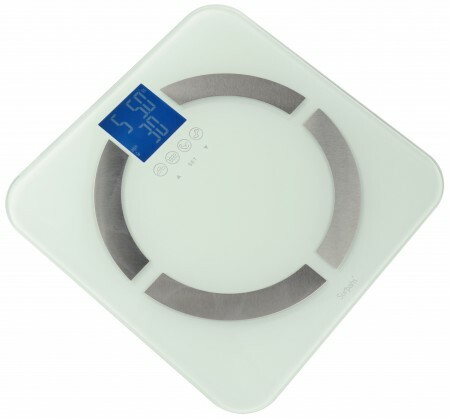 Overall the BIA provides an inexpensive, reliable way to estimate and track body fat level. To receive the most accuracy, please do not measure body fat within 30 minutes after a meal, or 120 minutes after an exercise. It is backed by a 100% satisfaction guarantee.